Let's face it you cant go more than 15 miles around the country without passing by a McDonald's, Burger King, Wendy's or all three. There are more than 33,000 Mickey D's worldwide and they are all pretty much the same crap at every location. But believe it or not there was a time when the chains of the word were actually good for the people and their communities and not just corporate conglomerates. It is with great comfort that I bring you two of the original burger shacks that once thrived with 100's of locations throughout the Midwest and now barely survive. Get at them if you ever have the chance. Kewpee Hamburgers is the 2nd known chain of fast food restaurants and was founded in 1923 in Flint, Michigan. In case your wondering White Castle is the first, founded in 1921. It was founded under the name "Kewpee Hotel Hamburgs" and is named after the Kewpie doll which has to be one of the creepiest little dolls I've ever seen. During its peak which came Pre-World-War II there were more than 400 Kewpee's in operation with more than half closing during the great depression. Today there are just five left with three locations in Lima, OH and one location in both Lansing, MI and Racine, WI. They once had over 200 restaurants east of the Mississippi river before 1938. That's 25-30 years before the first McDonald's even served a hamburger or shake to a single person. I have had the pleasure of being able to eat at the Kewpee location in Racine, Wisconsin (right up the lake from Chicago) numerous times. This particular location was founded in the 1920's and aside from the building which has changed three times not much else has changed at this five star burger shack. The current location was built in 1997 but retains the classic art deco look of the building built in 1939. You definitely feel like your stepping back in time upon entering. Your greeted by beaming tiled floor, countertop with stools and a whole bunch of those creepy dolls. It has the feel of a classic burger joint. You pretty much know its the real deal even before your first bite. The burgers at Kewpee start off as little balls of meat that are thrown onto the flattop after getting seared the grillman gives the ball a few slaps and flattens it into a patty. You have the option for a single or a double and they come with ketchup, mustard, onions and pickles. It is said that Samuel Blair the chains founder also created the "deluxe Hamburger".The place is so old school that if you order a hamburger it comes wrapped in paper whether your eating it in or taking out. Cheeseburgers that are consumed dining in always come on a plate because that's the way they've always done it. The fries are a frozen crinkle cut variety and just ok but they do fry them up perfectly making them a little better than average. What would a classic Midwest style burger joint be without homemade root beer? make sure to get a cold mug of their top notch homemade root beer with your meal. Kewpee's has been one of my favorite burgers since my first trip there a few years back. It has to be one of the better burger joints in the country for both ambiance and flavor. It also might be one of the most eerie. Those dolls are weird and the only thing I cant recommend at Kewpee's is sitting next to the large case displaying 100's of Kewpee dolls staring at you while you eat. I love the history behind the place and the fact that it is one of a few left of a once thriving chain. Its one of those burger joints where you can taste the history. As far as the burger goes you cant find a better deal then a double cheese for $3 tax included. Kewpee is so much a part of hamburger history that without it you wouldn't even have Wendy's. The founder of Wendy's Dave Thomas grew up as a kid near a Kewpee's in Kalamazoo, Michigan and loved eating at the restaurant so much that it inspired him to get into the business. This burger is right up there for best in Wisconsin and one of the tastiest old school style burgers anywhere. It tasted like...fresh meat. Hey, aren't you hungry for a Henry's? Its a slogan that was once well known throughout the Midwest and the Henry's burger was a part of every family's diet that lived near one. Henry's Hamburgers was formed when the Bressler Ice Cream company decided to get into the drive in business. The chain was started right here in Chicago which isn't too far from where another corporation is said to have gotten its start in Des Plaines, Illinois in 1955 when Ray Kroc opened up a burger joint. By the 1960's there were over 200 Henry's locations from coast to coast with the operation headquarters in Chicago. It's not hard to believe that this place could of been McDonald's if fate went there way. Instead we are left with an outlet of Henry's located in Benton Harbor, Michigan which is also up the lake from Chicago. The website of Henry's Benton Harbor location tells its story like this. 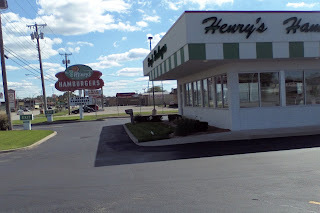 "Don Bishop and Harold Shook opened the Benton Harbor Henry’s in April of 1959, in the new Fairplain Plaza Shopping Center. They established a reputation for service and value, listening to their customers instead of the franchiser, which enabled them to remain in business after the Henry’s chain ceased to be a player in the 1970’s. This was strictly a carryout business until the addition of drive thru service in 1988, which now accounts for over 70% of sales." Its no coincidence that both Henry's and Kewpee's are well documented over at LTHforum.com. You'll be hard pressed to find a classic joint that isn't. When I first read the description of a Henry's Hamburger made by poster JeffB over at LTHforum I got a nice kick out if it but thought it was oh so true and I cant explain it any better myself so here it is. "If you ever wondered what would happen if a White Castle mated with a McDonalds cheeseburger, wonder no more. Thin, onion-steamed patties on very nice buns in the regular (i.e., non-slider) format. A double or triple is required given the slight patties, cheese under and between each layer of meat." I've been going to Henry's since I found it back when I was in high school. I'm lucky enough to get to spend a few weeks every summer in Michigan not far away and we've been chowing down on these burgers since I first found it. Which came right around the time I got my license. I will also point out just like JeffB that Henry's it isn't too far from one of the country's best beaches, the shoreline of St. Joseph, Michigan. Check out the Henry's website and this nice little page from Michigandriveins.com for more about the history of Henry's. Its one of the better little greasy fast food drive thru burgers I have had. I always go double with mustard, onions and pickles. If your taking a trip along Lake Michigan or anywhere near either of these wonderful classic burger joints for a summer road trip then I would highly recommend you get to one of them because they don't disappoint. You have such a great blog! I'm glad I found it. Too bad Henry's isn't in Chicago anymore, would have loved to try it. YUMMY!!!! 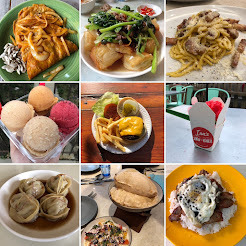 Because I am working on several nationally known burger restaurant in the country I've been studying burger places all over.. From Vancouver to Indianapolis. I would like to add Terry Turf Club in Cincinnati... Modern burger in Vancouver is soo great. went to Kewpees today for the 1st time. got the root beer and a double cheese with everything. my friend ordered the same but got fries too. was distracting. That being said, we both ordered a single cheese after we finished our doubles. Next time I'm going to buy a Tshirt, and the road construction in this area is PRETTY BAD, just sayin. Keep it up KingT. Thanks for the Kewpees review.